Delicious Latin-inspired treat made with traditional holiday ingredients, such as dried fruit, coconut and pecans, is perfect for gift-giving! Beat cream cheese, butter, sugar and vanilla in large bowl with mixer until blended. Add flour and baking soda; mix well. Refrigerate 1 hour or until chilled. Heat oven to 325°F. Line 13x9-inch pan with foil, with ends of foil extending over sides. Spray with cooking spray. Roll out dough on lightly floured surface to 15x11-inch rectangle; press onto bottom and 1 inch up sides of prepared pan. Prick bottom of crust in several places with fork. Bake 10 min. Mix sweetened condensed milk and eggs until blended; pour into crust. Top with remaining ingredients. Bake 20 min. or until center is almost set. Remove from oven; cool completely. Use foil handles to remove dessert from pan before cutting into bars. Prepare cream cheese dough as directed; press 1 Tbsp. onto bottom and up side of each of 24 miniature muffin pan cups. 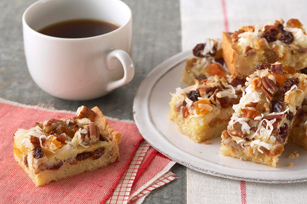 Fill with dried fruit, nuts and coconut; top with sweetened condensed milk mixture. (Do not overfill.) Bake at 325°F for 15 min. or until centers are almost set. Cool completely. Various blends of chopped fruits are available - select your favorite variety for this recipe. Or, you can make your own dried fruit mix. Create a tropical blend using dried mango and pineapple, or a berry blend made with dried blueberries. Substitute 1-1/4 cups of finely chopped mixed dried fruit for the 7-oz. package of dried fruit bits.